You’re on page 6 of 8 Graduation wishes, messages and quotes: College Graduation Quotes. See menu at bottom of page. These college graduation quotes provide you some choices when you’re looking for the right words for the graduate in your life. Graduation is one of the significant milestones in anyone’s life. It is the commencement of perhaps the most important phase in your life when you plan to become a giver and contributor in this world. It is a great moment for everyone around you, especially your parents. To understand the importance of graduating from college, you should ask it from those who never achieved it or those who failed at it and never looked back. 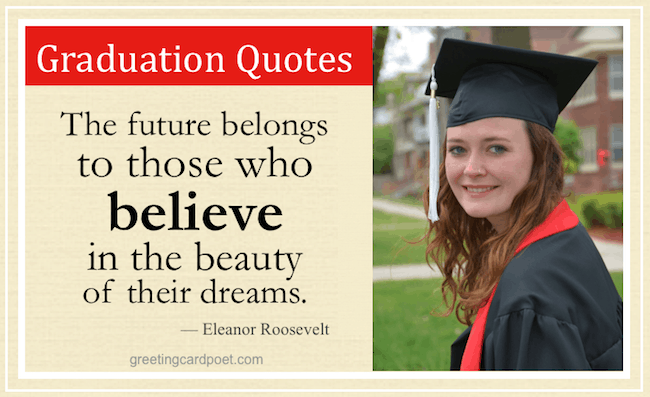 Whether you are looking for inspiration and great wishes for yourself or a loved one, here are some famous graduation quotes and sayings that can move souls! There is a good reason they call these ceremonies ‘ commencement exercises’. Graduation is not the end; it’s the beginning. It is not the size of the arena in which you find yourself that counts; it is what you do with it. So how do you know what is the right path to choose to get the result that you desire? And the honest answer is this. You won’t. You are graduating from college. That means that this is the first day of the last day of your life. No, that’s wrong. This is the last day of the first day of school. Nope, that’s worse. This is a day. Remember that there’s no one way of doing things … If you just get a hammer and hit it really hard, whatever it is, I guarantee you it’ll open. Now that you’ve graduated, just remember: Bosses don’t usually accept notes from your mother. Your life is your story, and the adventure ahead of you is the journey to fulfill your own purpose and potential. You don’t go to university so you can punch a clock. You go to university so you can be in a position to make a difference. Just about a month from now I’m set adrift, with a diploma for a sail and lots of nerve for oars. Coach said. The quality of a man’s life is in direct proportion to his commitment to excellence, regardless of his chosen field of endeavor. Just because you don’t know what you want yet, it doesn’t mean that there’s nothing to want. So many of our dreams first seem impossible, then they seem improbable, and then, when we summon the will, they soon become inevitable. The very purpose of our life is happiness, which is sustained by hope…. Hope means keeping going, thinking, ‘I can do this.’ It brings inner strength, self-confidence, the ability to do what you do honestly, truthfully and transparently. Be Bold. Be Brilliant, and Be You. Don’t live down to expectations. Go out there and do something remarkable. Take it all one day at a time, and enjoy the journey. Greatness is not in where we stand, but in what direction we are moving. We must sail sometimes with the wind and sometimes against it – but sail we must, and not drift, nor lie at anchor. There is no passion to be found in playing small, in settling for a life that is less than the one you are capable of living. Education is the process by which the individual relates himself to the universe, give himself citizenship in the changing world, shares the race’s mind and enfranchises his own soul. If you have suggestions for college graduation quotes, please let us know via the Contact page. Thanks!